Q: What do former SCTNTP alumni say about the program? “This program is everything it advertises itself to be. I feel that Sally portrayed everything with complete accuracy and honesty. I remember laughing when reading sections of the application form, but everything is rooted in the absolute truth! If you have any type of dietary restriction, peanut allergy, MSG intolerance and/or don't think you can deal with eating Chinese food (not talking Panda Express here!) for almost a month straight, this is probably not the program for you. If you can't tolerate oppressive heat and humidity, this is not the program for you. If you are not in extremely good physical condition (e.g. can't handle lots and lots of walking, climbing multiple flights of stairs several times a day, or if you have respiratory issues), this is not the program for you. If you expect things to be the way they are "at home", this is not the program for you. If you can't deal with squat toilets, this is DEFINITELY not the program for you and you should probably steer clear of China and most other Asian countries! There were a few times during the program when I caught myself thinking, "Oh, this is what Sally meant when she said ________." Reading it is one thing; experiencing can be something completely different, so you need to be brutally honest in terms of what you're truly able or willing to deal with. The actual teaching can be challenging and exhausting, but what you receive in return is way more than fair. The accommodations in Nanjing and two weeks of travel were top notch. To get a better understanding of the program, please visit Alumni Comments on our website. Thank you! Q: Who sponsors this program? A: It is sponsored by local private K – 12 boarding schools in China. Q: Do we get paid? A: There will be no stipend. 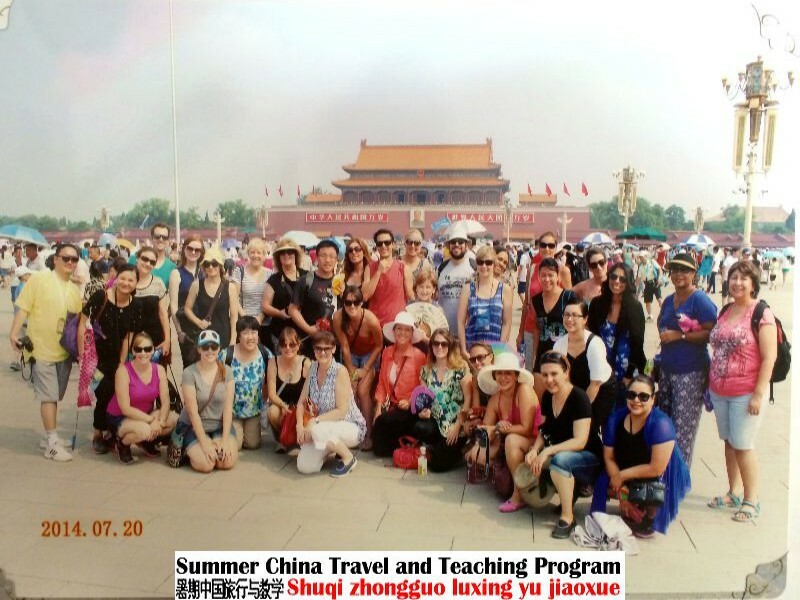 This program is an educational and cultural exchange program that offers American teachers a unique cultural experience through FREE tours in China as well as Chinese culture workshops on campus in exchange for providing 12 days of English instruction for the Chinese students. Meals and hotel housing are provided during the duration of the program. Q: How long is the program and when does it start? A: The program is 25 days long. Tentative travel schedule is from last week of June to the third week of July. Please check the website for the tentative travel schedule for the current year. Q: What is this program like in general? A: This program is a very fast-paced and activity-filled program. It demands high energy and excellent health/physical conditions from teachers. 24 hours of international flight including transfer and layover time followed by night tour upon arrival in China. Fully scheduled tours in each city with some evenings scheduled for free activity time. A large amount of walking daily as well as stair climbing on campus. 12 days of instruction with six 40-minute class periods daily – three periods in the morning & three periods in the afternoon. The weather is extremely hot and humid, and rainy on some days. This program is not recommended for applicants who have medical, physical, and/or mental problems that will interfere with their ability to teach and travel in the extremely hot, humid weather. Q: What are my financial responsibilities for this trip? Domestic travel to the departure city (Los Angeles) in the US. Passport application and visa application (approximately $220+ including service fee for visa application). Meals outside school on teaching days and during free time on tours (Meals are inexpensive in China). Gifts purchased for school officials, Chinese teachers, and students. Gratuity ($130 for 9+ days of tours) for tour guides, bus drivers, bellmen, etc. Transportation for personal needs (Cab fees are inexpensive - starting fee for cabs is approximately $1.50). Additional costs for any flight changes ($200+) or hotels for extended stay in China at the end of the program. Penalty fees ($250+) for name change after airplane ticket is issued. Penalty fees ($350+) for canceling your international flight due to any emergency after it is confirmed. Penalty fees for lost keys to the hotel rooms or any damaged items in the hotel rooms. International Medical Insurance if you are not covered by your health plan. Medical treatment at local hospitals in China. Other personal purchases (Small souvenirs are inexpensive). Q: Do I need to pay for the airfare? A: All selected teachers will pre-pay their group international airfares through a designated travel agency. They will receive full cash reimbursement when they complete the 12 days of instruction. Further explanations will be provided in the final agreement for selected teachers. Q: Will there be any penalty if I have to cancel the trip due to change in plans? A: Yes. You will need to call the travel agency where you purchase the ticket immediately for flight cancellation. The penalty could be up to $350.00+. Q: Will there be any penalty if my ticket needs to be reissued for name change or change of flight schedule after my flight is confirmed and ticket is issued? A: Yes. There will be a penalty of at least $250.00 for any reissued tickets. Note: It’s important that you provide your full legal name in your application. Passengers whose name on the airplane ticket does not match the one in their passport will not be allowed to board the plane. Q: Do I need to pay for the tours in China? A: No. Meals at school and on tours, hotel housing, transportation (bus and domestic flights in China), and admissions to scenic spots are all paid for by the school. Q: How many days do we tour for and where do we tour in China? A: Total 10 days of tour is split into 2 tours before and after 12 days of teaching. Cities that teachers will be touring are Shanghai , Hangzhou, Xi’an, Beijing , and Nanjing (if assigned to school in Nanjing), or Suzhou (if assigned to school in Suzhou). Q: Where do we stay while we are in China? A: Hotel housing – Three -Star hotels based on the Chinese standards. Hotels for the program vary every year. For details, please check hotel information in Travel on the website. Q: How is the weather during that time? A: Extremely hot (in high 90s) and humid (in high 90%). It can be very rainy in early July. This program is not recommended for applicants who cannot tolerate heat or humidity. Q: Do we fly to China as a group, or do we fly by ourselves? A: All teachers must travel together as a group on the same departure date from Los Angeles to China. Q: Can I bring my family or friends to the program? A: No. This program is for participating teachers only. Family members or friends are welcome to join the participating teachers after the post-tour ends in Beijing. Q: Who is qualified for applying for this program? Applicants must be residents currently living in the US when applying for the program and prior to flight departure from the US. Applicants must be in excellent health condition for walking, stair -climbing, and hot, humid weather. The three-week activity-filled summer program demands tremendous energy and endurance. Teachers who hold a multiple-subject or single-subject credential issued by any state in the US. Student teachers in the credential program who have done at least one semester of student teaching in the K – 12 schools. Non-credentialed private school teachers who have had teaching experience in the K – 12 schools. Graduate students in a TESOL Program at an American university (K – 12 teaching experience preferred). Community college teachers who have had teaching experience in TESOL/foreign languages. All candidates are required to have high proficiency in English needed by the Chinese schools that sponsor the program. Applicants must have the ability to adapt to changes in routine. Selection priority is given to the experienced teachers who are currently teaching or who have had years of teaching experience in K – 12 ESL, K – 12 foreign languages, or K – 8 English language arts. Selection priority is given to the experienced teachers who are currently teaching K – 12 ESL, K – 12 foreign languages, or K – 8 English language arts. Q: I have taught English in Asia before but I don't have a K - 12 teaching certificate. Can I still apply? A: No. We are very sorry that the local Chinese schools need credentialed teachers. Q: I am a college ESL teacher and I have no teaching credential but ESL certification issued by my university. Can I apply? A: You may apply but selection priority will be given to the experienced certified teachers who are currently teaching K – 12 ESL, K – 12 foreign languages, or K – 8 English language arts. Q: I teach Math/Science/Social Studies/PE, or I am a school counselor at a K - 12 school. Can I apply? Q: How many days and how many class periods do I teach per day? A: 12 days of instruction with six 40-minute class periods daily – three class periods taught to Class A in the morning & three class periods taught to Class B in the afternoon. Q: How many students are there in each class? A: 25 – 30 students in each class. Q: Does the Chinese school have curriculum for us to teach? A: The schools have limited resources. Limited textbooks are provided. Teachers are encouraged to supplement the core curriculum with their own curriculum and materials. Q: What part of the language areas do we focus on in teaching for this special program? A: Instructional focus is listening and speaking. This program is to help students enhance their oral language proficiency and vocabulary building with minor emphasis on reading and writing. Q: Do they have LCD projector and document camera in each classroom? Q: Does the school have a CD player? Q: Does the school have Internet in the classroom? What about hotels? A: Wireless Internet is available in the teachers’ workrooms and most of the hotels. Some hotels provide free Internet connection through Ethernet Cables. Q: Do I need to bring my laptop? A: It is highly recommended for convenience of instruction and communications with families. Q: Does the school provide supplies for us? A: Yes. The schools will provide teachers with basic supplies for their instruction. Q: Can we make copies? A: Yes. Copies can be made through room teachers in the copy room. Q: How many years of English have students learned? A: The number of years of English learning is equivalent to their current grade level. For example, 3rd graders in the summer program have learned English for 3 years. There is a wide range of proficiency levels in each class. Differentiated instruction is expected to be included in the daily instruction. Q: Do I need to do pre-tests and post-tests? A: No. This short program is an enrichment program for English language learning. Q: Do we know our grade level assignment before we leave? A: Teachers will be given tentative grade level range for curriculum preparation prior to their departure from the US. Actual grade level assignment will be given on the day before summer camp starts. More information will be provided for the selected teachers in April. Q: Does the school give us a certificate for professional development at the end of the program? A: Yes. At the end of the program, a certificate of professional development and verification of 12 – day instruction will be issued to each teacher who completes the program.